EXPLO has a long-running partnership with Dr. Eyre. As an undergraduate at Williams College, Dr. Eyre worked at EXPLO in the summers from 2004 to 2006, teaching courses in dissection and EMT training while also serving as an RA for a hall of seventh grade boys. 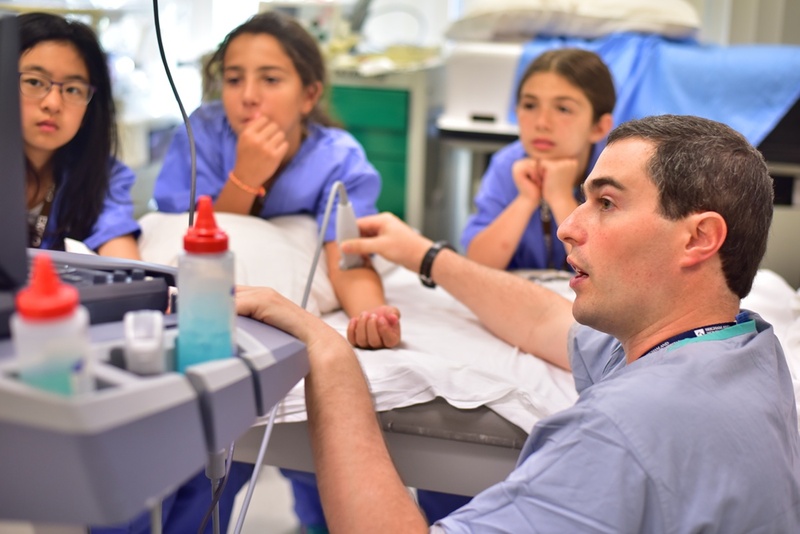 He came back to EXPLO as an advisor for the Emergency Medicine Focus Program, which introduces students entering grades 6+7 to many roles in emergency medical intervention. Dr. Eyre comes to campus to speak with students about being an emergency room physician, and hosts students on trips to the STRATUS simulation center at Brigham and Women's Hospital. Currently, Dr. Eyre is collaborating with the EXPLO curriculum team for a new Medical Rounds Focus Program for students entering grades 8-10. As a natural next step from the Emergency Medicine program, Medical Rounds students will apply foundational knowledge to specific case studies that Dr. Eyre has created especially for EXPLO. 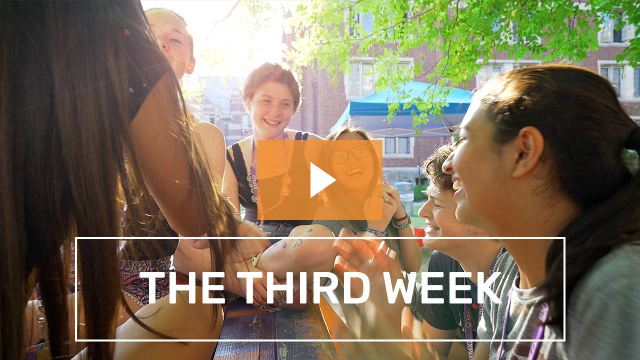 Here, he discusses the state of medical education, the new program, and why early exposure to the medical field is an advantage for young students. Our interview with Dr. Eyre has been condensed and lightly edited. Why do you think it’s worthwhile for students at this age to get into exploring the medical field? I was really young when I got my first exposure to medicine. I started following my dad on rounds in the hospital and getting a taste for what medicine actually was. It’s a great age to spark that interest and get people on a pathway toward seeing if this something they want to do with their lives. My hope is that students come away with some of the same passion and enthusiasm that I had, and a lot of my colleagues had, when we were that age. What skills will students be learning in the program? It’s designed to be a broad, high-level overview of medicine to give the students a taste of what a career in medicine will look like. The goal is to make it a case-based experience. As a doctor, you need to understand what vital signs are and how to get a history and how to do a physical exam, and then how to interpret blood tests and X-rays and CAT scans. So the goal is — for people without any medical experience to begin with — to give them different educational modules and experiences so that they can work through and solve these cases, and come up with a diagnosis and management plan.
. . . the students will be getting experiences through these courses that most medical students would kill for, that a lot of doctors would kill for. How will students be doing this? Will they be working with real, living patients? We bring them into a state-of-the-art simulation center — the STRATUS Center at Brigham and Women’s Hospital [where EXPLO Emergency Medicine students also work] — that’s one of the original simulation centers in the country. They’ll get experience working with ultrasound technology, and with mannequins that can talk and cry and sweat and blink. They’ll be taking vital signs. They’ll get practice suturing. They’ll experience what it’s like to be a surgeon in an operating room — a simulated operating room that is the same size and has the same equipment that we have in an actual operating room. They just get to do these amazing things with equipment that real medical professionals are working with. It’s one of the really cool experiences that simulation affords us. What do you think is gained by this kind of hands-on experience that can’t be learned in a book or in a classroom? Honestly, the students will be getting experiences through these courses that most medical students would kill for, that a lot of doctors would kill for. To come into these facilities and have these experiences, to work with the doctors and technologies that they do. When you’re studying in traditional classrooms, the content can seem very specific and it can be hard to see how it relates to bigger picture issues like patient care. The traditional student is often asking, ‘Why do I need to know this?’ or ‘Why am I learning this?’ So it’s exciting to use fun cases, fun equipment, interesting demonstrations, and be able to tie in why something that seems isolated and potentially not that interesting. Having worked at EXPLO when you were in college, why were you interested in collaborating with EXPLO again in this capacity? A lot of it stems back to when I was an instructor and teaching EMT — to see kids get so much enjoyment and excitement out of the things we were talking about. It’s just appealing to work with students who are as engaged and interested and just interesting as the EXPLO students are. 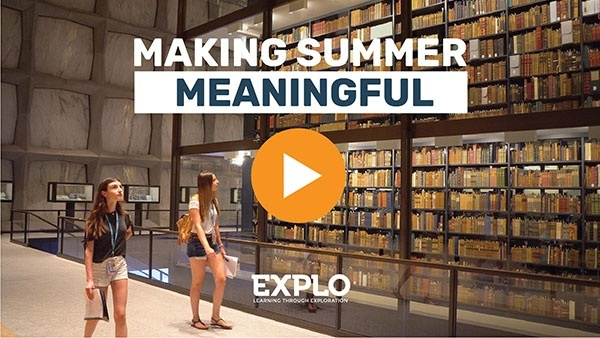 I frequently think back to just how much effort and energy EXPLO puts into their curriculum, into coming up with innovative and truly excellent educational experiences. What stands out from your EXPLO experience? What did you take away from it? I think probably the biggest thing I took away from it is how hard you have to work and how much thought you have to put into educational curriculum if you want it to come out really well. I think medical education is a little bit behind, honestly. 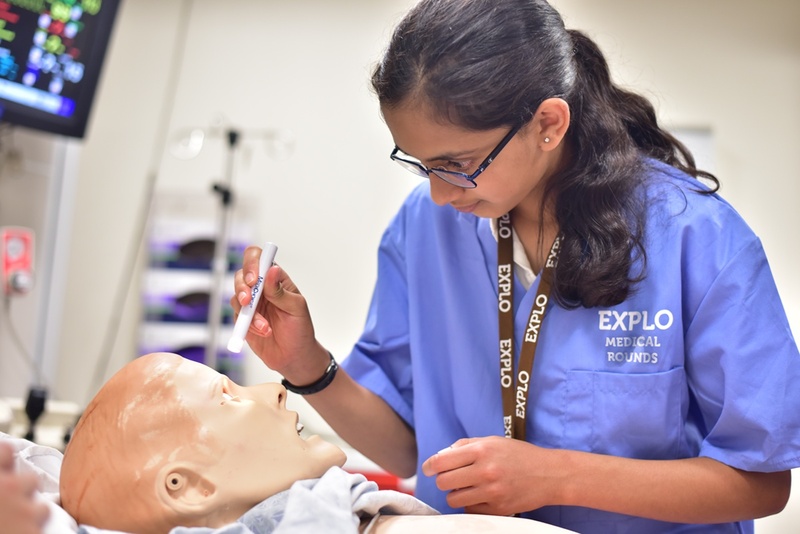 So now as I go into a career in medical education, I frequently think back to just how much effort and energy EXPLO puts into their curriculum, into coming up with innovative and truly excellent educational experiences. What excites you about these programs? What these students will get to do, it’s really quite impressive the facilities they’re going to visit and the people they’re going to interact with. It’s really an opportunity that few people get to have. I’m pretty excited that we’re bringing kids this age into some of the top hospitals in the country and, particularly in Medical Rounds, they’re getting to experience things that, as I said, a lot of doctors and medical students would absolutely kill to be able to do.